The third game by the Punch-Out!! team was this arm wrestling simulator with similar gameplay to the boxing titles. You are taking on some of the baddest arms in the world to become the World Arm Wrestling Champion. You have to quickly learn the tactics of each arm wrestler to beat them. Tap the button to push their arm down, but if they pull a strange face then they are likely to start pushing back. You have to wiggle the controls, tap the button, and try to catch them off guard in order to beat them. Arm Wrestling, like the two Punch-Out!! games, used two screens. The top screen showed various information and the winnings you have taken, while the action took place on the bottom screen. The third challenger in the game is a mysterious opponent called Mask X. Before you can pin his hand to the table you have to surprise him by tapping up rapidly at the last moment, pulling his mask off. 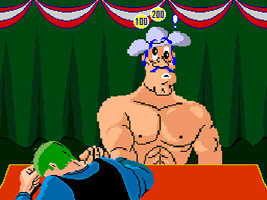 Underneath the mask is Bald Bull, one of the fighters from Punch-Out!!. As a side note, some of the music in this game is also taken from the Punch-Out!! arcade games, but this isn't really a cameo, as the games were made by the same team.